Mars Ice House was the winner of NASA’s 3D Printed Habitat Challenge Design Competition. Image: courtesy of CloudsAO / SEArch. The ice house is designed as a series of nested domes that are shaped as a fin and enclosed within a transparent EFTE film. Image: courtesy of CloudsAO / SEArch. Water is the primary resource that has been used in the conceptualisation of the Ice House habitat design. Image: courtesy of CloudsAO / SEArch. A front yard offers an open space for relaxation and contemplation. Image: courtesy of CloudsAO / SEArch. 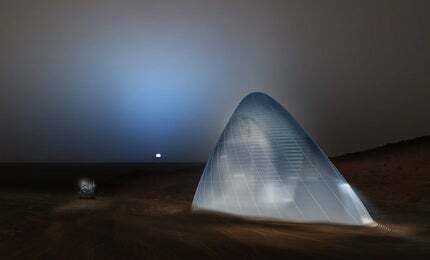 Mars Ice House, a proposed interstellar habitat by Clouds Architecture Office and Space Exploration Architecture, won the 3D Printed Habitat Challenge Design Competition organised by NASA in partnership with America Makes. The competition was announced in May 2015. Part of NASA’s Centennial Challenges programme, the competition required participants to design a habitat on Mars to accommodate four crew members for NASA’s deep space explorations using 3D printing technology and resources available on Mars. The winning proposal was awarded a prize of $25,000 out of a total of 162 participants at the New York Makers Faire held at the New York Hall of Science on 26 and 27 September 2015. The design competition forms the first phase of a multi-phase $2.25m challenge, while the later stages focus on fabrication technologies and use of indigenous materials and recyclables for constructing habitats. "Translucent ice will be used for building the Mars Ice House using 3D printing technology, which will also guard astronauts from radiation." Translucent ice will be used for building the Mars Ice House using 3D printing technology, which will also guard astronauts from radiation. Ice will allow light to flow in, creating a glowing beacon at night time on the martian land. The ice house is designed as a series of nested domes that are shaped as a fin and enclosed within a transparent EFTE film that will protect the 3D printed shells from changing into a gaseous state in the martian atmosphere. A spiral rib will be designed for easy navigation of the interior surface of the ice shells by printing robots. Exhibiting a double-shell structure, the space between the inner habitat and outer shell will function like a yard and provide astronauts with an interstitial zone that can be inhabited without their extravehicular activity (EVA) suits. Rooms are curvaceously designed to lend the impression of a larger living space. The interior volume of ice is printed as a series of excavated or hollowed-out space to give the illusion of walls or space divisions. A front yard, formed between the inner habitat and outer shell, will offer an open space for the crew to relax, exercise, play or for contemplation. The area will be pressurised and can be enjoyed with the use of an oxygen mask alone. Acting as a buffer zone, the yard will limit contamination of the martian space by absorbing any leaks from the habitat controls or life support systems. A vertical garden is designed to encompass the crew and provide excess oxygen to the front yard. Experimental plants for consumption can be grown in the garden, which also exposes the crew to plants and colours during their busy schedule. The ‘space resort’ is designed to orbit the earth at a distance of 450km, and at a speed of 30,000km, and will accommodate a maximum of four guests and two astronaut pilots. Water is the primary resource that has been used in the conceptualisation of the Ice House habitat design. To be formed on Alba Mons in Mars’ northern hemisphere, the habitat will use the large water supply available in the region. The building resource selection separates the Ice House’s design from earlier ideas that primarily focused on burying the structure beneath layers of hazardous regolith surfaces out of fear of cosmic and solar radiation. A protective and transparent EFTE membrane used for encompassing the habitat is reinforced with tensile Dyneema. The design for the Ice House is based on capturing and storing subsurface ice and heating it using the sun’s radiation. The gaseous state of ice obtained through the process can be collected and used for printing a solid water ice structure. Building on concepts of phase change, and temperature and pressure conditions on the martian surface, the team has formulated a process to convert subsurface ice into water vapour to print a form in solid ice. The proposal for the Mars Ice House was created by a team comprising architecture and space research experts at Clouds Architecture Office and Space Exploration Architecture respectively. A team of 15 leading subject matter experts were also part of the proposal that comprised scientists, astrophysicists, geophysicists, ice experts, structural engineers and 3D printing engineers.